According to reports late Monday, Apple may be planning on rolling out a new app discovery feature for the iOS App Store as users have spotted a new option that suggests terms related to a given search. The new feature, first spotted by developer Olga Osadcha, appears while conducting a search in the App Store app. Currently, the "Related" suggestions appear to be limited to iPhones running iOS 7.1 or higher and is not showing up on the iPad or desktop versions of iTunes. As seen in the example above, when a user enters a keyword like "password manager," the App Store recommends a number of related search terms in a row directly below the search box. Clicking on one of the suggestions open a new pane populated with apps corresponding to the selected search term. It looks as though results are commonly used phrases possibly pulled from popular keywords or phrases queried by other users. Previously, App Store discovery was restricted to a Related subsection within an app's preview card. The section is usually filled with other apps from the same developer, popular titles within a given category and a "customers also purchased" list. 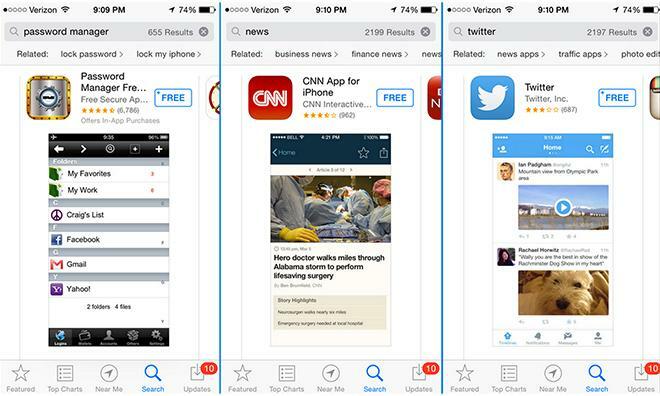 In 2012, Apple acquired app search engine Chomp. Shortly after the purchase, Apple brought Chomp-style "app cards" to iOS 6, but the company has yet to incorporate the erstwhile service's powerful recommendation and discovery features. At the time of this writing, access to the "Related" menu bar is sporadic, suggesting Apple is testing the functionality ahead of a more formal rollout.